Find out how to create interpersonal connection through trust and practice, reflection, evaluation and self-motivation. 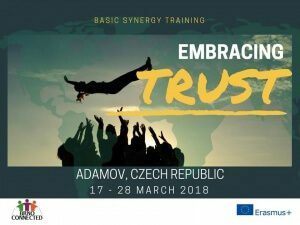 Embracing Trust is a 10-day training course focused on fostering mutual trust through intercultural personal connection, empowered communication and uncovering one´s potential. You can look forward to intensive self-development, outdoor, task which will test your body and mind as well, creative workshops, discussion, reflection and much more. You will meet participants from 8 different countries: Czech Republic, Bulgaria, Greece, Hungary, Romania, Croatia, Spain and Italy. You will get space to explore your communication patterns, develop your creativity and proactivity, create authentic relations with others and with yourself and discover your potential. It will also be about self-expression and cooperation with others, regardless of their cultural or social background. The whole programme is very experiential and based on “learning by doing” approach. You can expect very intensive days full of different activities. you are highly motivated and willing to actively participate during the whole project. The projects is funded through Erasmus+ programme which means that food, accommodation, programme, materials and travel costs according to the given distance bands (check infoletter) are fully covered. If you have any questions, feel free to contact us at brnoconnected@gmail.com.